China’s massive project has enormous implications for Greece, and Europe. Eight thousand kilometers of ancient cultures link the cradles of Western and Eastern civilization. It was through these routes – first called the Silk Road in 1870 – that Genghis Kahn arrived in Europe and Alexander the Great almost reached the Chinese province of Xinjiang. The Hellenic world and Eastern Europe have carved mathematics and Indo-European languages along these tracks, while the Greek-Buddhist syncretism influenced the development of art and philosophy in China and India. Today China is busy restoring the Silk Road to its former prestige. The One Belt One Road (OBOR) project entails more than $140 billion in investment, which aims to connect more than 20 countries through the construction of new maritime and land infrastructure corridors between China and Europe. A recent Carnegie-Tsinghua study asks whether this ancient cultural bridge might now able to positively impact the eurozone, stimulating a Greek economic recovery. Despite the collapse of international investment, China has continued to demonstrate that it has not given up on Greece. Indeed, Greece represents for China something that has been defined by the New York Times and the Wall Street Journal as one of its most successful foreign trade initiatives. 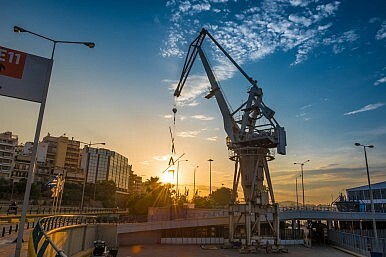 The Greek Port of Piraeus is the first stop in Europe for numerous passengers and Greece boasts the world’s largest merchant fleet, carrying 60 percent of Chinese exports worldwide. Since 2000, thanks to Cosco, China has effectively exploited the size and centrality of Piraeus port, now controlling two-thirds of its total traffic. In 2013 Beijing agreed to invest $258 million in developing the port, increasing Greek profits by 12 percent and facilitating the wave of privatizations that the so-called Troika of the International Monetary Fund, the European Central Bank, and the European Commission were seeking. Chinese banks have also earmarked considerable loans for Greek ship-owners, who have agreed to build their new ships in China. Other collaborations encourage naval research and development programs between the universities of the two countries. Meanwhile, through the Fujian Shipbuilding company, Beijing aims to access European technology, especially military, financing naval armament agreements valued at more than $3 billion, representing 7 percent of Greek GDP, and providing 190,000 jobs. China has also invested $6.7 billion in upgrading Athens airport and $1 billion in the construction and management of Crete Airport, which will become the second largest airport in Greece. Chinese travel to Greece has meanwhile surged, rising 70 percent in 2014 alone, to 100,000 visitors. Piraeus port together with Greek airports are a great opportunity for China to expand its presence in Europe. Given the magnitude of these projects, governments are required to implement policies designed to increase cooperation and co-financing between companies, tourist actors, and international stakeholders aiming for European Investment Bank funds. This is especially important now that, notwithstanding pressure from Washington, the Asian Infrastructure Investment Bank has gained Brussels’ blessing. The New Silk Road project also includes the construction of a railway line that will connect Piraeus port and Central Europe. According to researchers Zhang Lihua and Vasilis Trigkas, this project could be financed jointly by the EU fund for investments proposed by European Commission President Junker and the Silk Road Fund announced by Chinese President Xi Jinping. This action will not only boost Greek GDP, but also has the potential to redefine geopolitical relations in Central and Eastern Europe. This is an area of great strategic interest to China, as demonstrated by the China-Balkan Summit in Belgrade a little over a year ago. The new railway would positively impact Balkan economies and would reconnect to the infrastructural corridors that will cross Ukraine and Russia from the east. Russia is also stepping up its investment in Greece, aiming to create a pipeline that will take advantage of the huge gas deposits in the Aegean sea. Greek Prime Minister Alexis Tsipras seemed to be aware of these trends, and has focused on a more aggressive foreign policy, initiating a real tussle over the renegotiation of important agreements between public institutions and European, American, Chinese and Russian investors. Despite the failure of these negotiations and the prime minister’s subsequent resignation (followed by his reelection), China’s presence in Greece and Eastern Europe continues to grow. Not even the recent weakening of the renminbi seems to have affected Beijing’s foreign investment there. For the more skeptical, the Chinese strategy seeks to exploit European weaknesses to increase its presence and hinder the process of integration. For the more hopeful, by contrast, as reflected in the Sino-EU strategic partnership, China wants to expand its influence but it needs a Europe able to be united and independent of the U.S. so that China can take on the Washington Consensus. Beijing OBOR not only has the potential to a stimulate a recovery in Greece and the eurozone; it could also have significant consequences for the European dialogue with Russia over the situation in the Ukraine and with the U.S. about the Transatlantic Trade and Investment Partnership negotiations. Moreover, the New Silk Road is based on the so-called Pacific Growth of a Communist Party that preaching for a neoliberal harmony of interests emphasize how peace is the best protection for its investments. Investments that at least for now and in theory, are a major boost for a euro that is reeling. Icarus flew away from the Cretan labyrinth of the Minotaur with wings that Daedalus attached to his body using wax. Who knows if Athens will decide to fly too high and whether the wings offered by Beijing will end up, as in the myth, melted by the sun. Gian Luca Atzori is a Sinologist, freelance journalist, and community and business developer.